Mercedes-AMG has teased the newest version of the second-gen Mercedes-Benz CLA which debuted at CES 2018. The performance model is termed the Mercedes-AMG CLA 35 4matic and follows the same formula set by its cousins the Mercedes-AMG A 35 and A 35 Sedan. The CLA35 will most likely be powered by a 2.0-liter, turbocharged four-cylinder which pumps out 306PS and 400 Nm. This will be paired with a seven-speed dual-clutch automatic. The A 35 Sedan can get from 0 to 100 kmph in 4.8s and onto an electronically limited top speed of 250 kmph, similar stats can be expected of the CLA. A new AWD system that can send up to 50% power to each axle is expected. There should be larger brakes, adaptive dampers as an option and brake-based torque-vectoring. The A35 may also be stiffer than the standard car with the addition of an aluminium shear panel and additional bracing under the engine. Styling changes to the CLA 35 will also seemingly mimic those of its cousins. 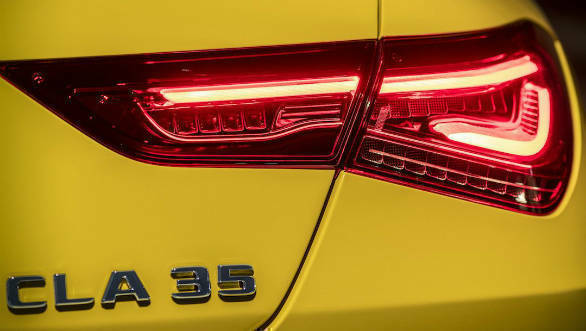 Like the A 35, the CLA 35 also seems to get that vibrant yellow launch colour. Other noticeable exterior features which set this car apart from the regular CLA-Class are the diamond pattern grille, the aggressive bumpers with the small fins on the edges and the prominent rear wing. These design traits are accentuated by the front splitter, side skirts, diffuser and 18-inch AMG alloy wheels.